Bennett College raised $8.2 million in its nationwide #StandWithBennett campaign. After 55 days of campaigning by Bennett College leaders, students, alumnae and supporters, the college announced on Moday, Feb.4, that it exceeded its $5 million fundraising goal. According to Bennett College President Dr. Phyllis Worthy Dawkins, the college is still counting donations. 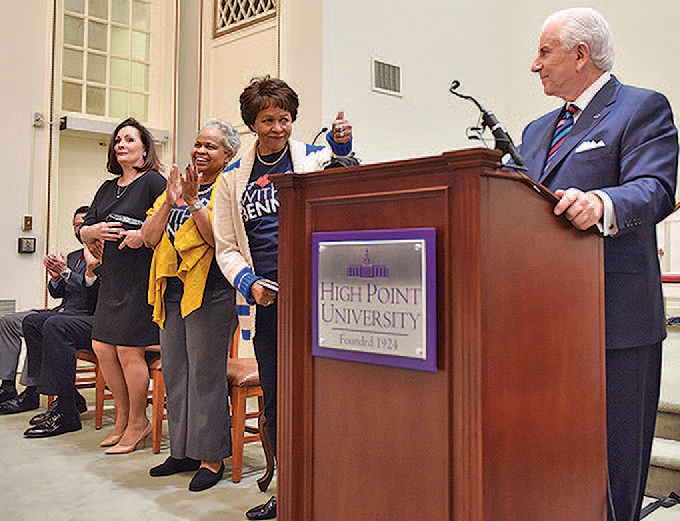 On the fundraising deadline of February 1, Nido Qubein, president of neighboring High Point University, (HPU) pledged up to $1 million to Bennett as a challenge grant. 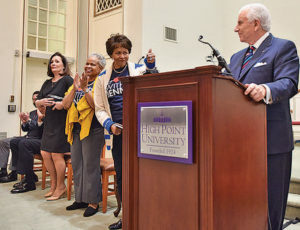 During a press conference held at Bennett College on February 4, President Qubein brought more gifts, including: a $650 check from money HPU students collected in their chapel; a check from an individual HPU student for $1,000; a check from an HPU parent for $10,000; a check from the Wyndham Championship for $25,000; a check from Old Dominion Freight Line for $100,000 and a check from BB&T Bank for $200,000. In total, Qubein dropped off $357,500 in checks. “This isn’t about the money. This is about the future of tens of thousands of young women who will enter the hallowed hallways of this college to learn and who will exit the hallowed hallways to serve the world and make it a better place, and plant seeds of greatness in the lives that they will cross along their pathway,” said Qubein. The college received donations from faith-based groups, higher education institutions, organizations, businesses, fraternities, sororities and community members to name a few. Founder of global lifestyle brand, SUPERCHARGED, Kwanza Jones, along with her husband José E. Feliciano, co-founder and Managing Partner of Clearlake Capital Group, L.P., a leading private investment firm in California, announced a $1 million gift to the college on Monday. The couple made the gift on behalf of Jones’ mother, Dorothy Wilkerson Jones, who graduated from Bennett in 1965 with a degree in pre-law and a minor in political science, as well as Jones’ aunt, Brenda Wilkerson Hoover, who graduated from Bennett in 1963 with a degree in elementary education. The #StandWithBennett Campaign also included an aggressive social media campaign that gained support from across the country, and the attention of celebrities, such as TV actor Jussie Smollett (Jamal Lyon, Empire). On December 14, 2018, Bennett leaders began reaching out to the public to help raise $5 million in order to reach financial stability under the Southern Association of Colleges and Schools Commission on Colleges (SACSCOC) guidelines, the regional accreditor which monitors, evaluates, and accredits education institutions across the country. SACS placed the college on probation for financial reasons in 2016 and does not allow for an academic institution to be on probation longer than two years. Although the college saw a rise in enrollment and a surplus of dollars at the end of the fiscal year 2017-18, it wasn’t sufficient enough to satisfy SACS guidelines. On December 11, 2018, the college was removed from membership from SACS and faced losing accreditation, which Bennett leaders quickly appealed. The college remains accredited during the appeal process and college leaders have made sure to emphasize that they were removed strictly for financial reasons and not sanctioned for its academics, faculty, leadership or students. The 146 year-old college, established under the United Methodist Church, is one of only two all-women’s historically Black colleges in the country. Now that the money has been raised, the next step is the formal appeal to SACS to keep Bennett College’s accreditation on Feb. 18 in Atlanta. Bennett administrators will be notified of the accreditation board’s decision on Feb. 25.